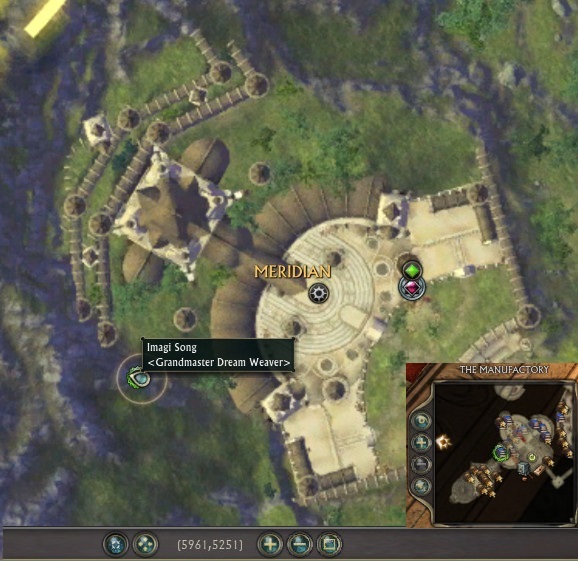 Dream Weaving is a new Craft Profession introduced with Patch 2.6 (12th Feb 2014). Dream Orbs (Stat Augments, like Runes, but stacks). All items crafted by Dream Weavers are tradeable. The following is a guide to everything you need to know about Dream Weaving. Dream Weaving is a new Craft Profession that arrived with Patch 2.6 associated with VFX dimension items, dimension keys and dream orb stat augments. 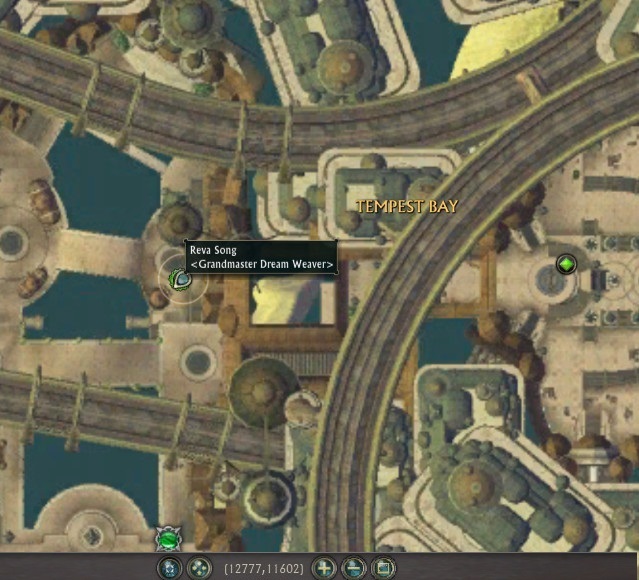 Tempest Bay – Trainer Reva Song is found next to the Dimension Key vendor in Tempest Bay at (12777, 11602). 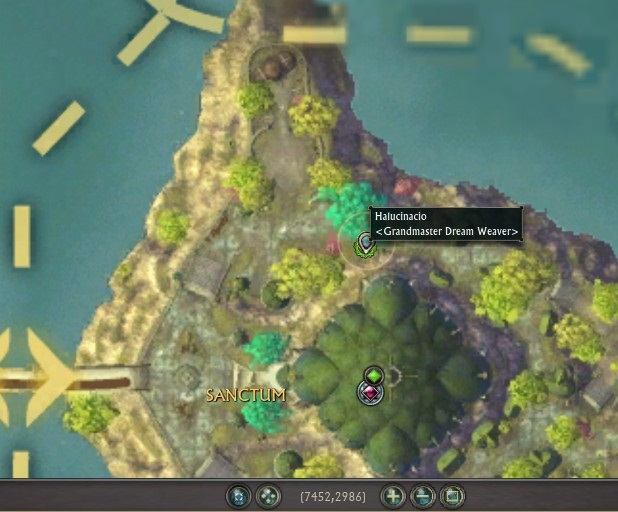 Sanctum – Trainer Halucinacio is found in the crafting area in Sanctum at (7452, 2986). Meridian – Trainer Imagi Song is found in The Manufactory (craft area) in the left-most room of Meridian at (5961, 5251). At present there does not seem to be any other trainers. That said, all characters are able to get to Tempest Bay (although those lower than Level 48 may require assistance via a summon or guild banner). You need an empty Trade Skill slot. Every character gets 3 free Trade Skill slots + Fishing + Survival. To obtain more, hit up the Rift Store -> Services section for a Trade Skill Extension. You can have a total of 10 Trade Skills (+ Fishing + Survival), so a single character is able to obtain all trade skills. Reva Song will provide you with a quest to craft a Dream Focus (which is the craft station used to craft Dream Weaving items – just like the one behind the NPC). You can place and use this Dream Focus as a crafting station in your own dimension. Dream Ribbons are obtained from using the Salvage Artifacts ability that you gain after you become a Dream Weaver. You can find this ability in your Abilities Window (default key “p“) in the General tab. As with all abilities, you can drag this onto your action bar for ease of access/use. Each Artifact gives a different number of Dream Ribbons, depending on your Dream Weaving level. As you can see, the difference between Grandmaster and Savant is pretty low. Only Uncommon increases from 4 to 5 and Epic increases from 28 to 30 dream ribbons. If you are leveling up your Dream Weaver, there’s no need to ‘hold out’ until Savant for most of the artifact rarities. Worried about filling your inventory with Dream Ribbon stacks? No problem! You can convert a 99 stack of Dream Ribbons into 1 Dream Bolt. Simply right-click a 99-stack Dream Ribbon to turn it into 1 Dream Bolt. You can also convert the Dream Bolts back into 99-stack Dream Ribbons by right-clicking on the Dream Bolt. Thanks to Ivnedar@Laethys for discovering this! Dream Weaving recipes require a variety of lumber, plants, cloth, leather, metal bars and fish to create as well as Dream Ribbons. This also means you will require these for leveling up. Note: You can use Skill Spheres bought from the Rift Store -> Boosts section to increase your skill point gain per craft. The Guild Perk “Journeyman” also gives you a 5-15% chance per craft to gain an additional skill point. Below is a link to a Google Spreadsheet with all the Dream Weaving Recipes including material costs, recipe costs and recipe levels. Below is a breakdown of the total materials required to level from 0 to 375 without Skill Spheres or any other bonuses. This list is based on the cheapest route, thus excluding Rift Store-bought recipes, Dimension Key recipes and Dream Orb recipes. This also assumes that you get 1 Skill Point per Recipe craft for every 10 levels. Does not take into account the Guild Perk: Journeyman. You may want a slight buffer just to be sure. Many Patrons would have Transcendent Skill Spheres left over from the 7x Transcendent Boost Packs that were given to Patrons a few months ago by Trion. Below is a breakdown of the total materials required to level from 0 to 375 using a Transcendent Skill Sphere. This list is based on the cheapest route, thus excluding Rift Store-bought recipes, Dimension Key recipes and Dream Orb recipes. This also assumes that you get at least 2 Skill Points per Recipe craft. Does not take into account the Guild Perk: Journeyman. You may want a slight buffer just to be sure, although with a Transcendent Skill Sphere you usually only need 5 crafts or less per 10 levels. One of the biggest perks of the Dream Weaving Craft Profession are the new Dimension Keys, all tradeable! They range from small dimensions all the way to large ones listed below. All tradeable when you craft them. Note: the “Key to Dimension: Anywhere” is a plain location with no doodads. These can be accessed from Rift Store -> Crafting -> Dream Weaving with a platinum or Credits option. Once again, these are tradeable! Dream Orbs are Stat enchants like Runes, but stacks with them that Dream Weavers can create. They go into the Helmet, Neck, Shoulders and Cape slots and have different level requirements dependent on the type of Dream Orb. They are tradeable and require a whole bunch of Dream Ribbons and other mats. Warning: They do NOT carry over when upgrading the underlying gear. *Dream Bolts are gained by right-clicking a 99x stack of Dream Ribbons. You can right-click the Dream Bolt to turn it back to 99x Dream Ribbons. Note: Skill Level = Dream Weaving Skill Level required to craft the Dream Orbs. Coruscating Shard = Coruscating Ethereal Shard obtained with 1,500 Empyreal Slayer’s Marks from Rift Store -> Crafting. You apply a Dream Orb to your gear in the same way as you apply Runes. They stack with Runes. Dream Orbs have a unique feature that distinguishes them from Runes in that they are not static stats – they are RNG. Each time you apply a Dream Orb you will receive one of 20 different combinations of stats which differs depending on gear slot, gear level/tier and type of Dream Orb used. Note: For Savant Dream Orbs, they only have 15 combinations. They do not have the Main Stat + END combinations. *Savant Dream Orbs do not have the Main Stat + END combinations. Of these, there are 5 combinations of stats for each of the above. As such, there’s a total of 20 different possible stats you can receive when you apply a Dream Orb. The actual amount of these stats depends on gear slot, gear level/tier and the type of Dream Orb used. Higher-grade Dream Orbs provide better stats with a tighter stat range. All combinations are listed so that you can hopefully make better-informed decisions about whether to risk losing your second-BiS stat in order to attempt to get the BiS stat, which may only be a +1 main stat difference. Hope this guide has helped you out with your Dream Weaving queries! Look forward to seeing what dimensioneers come up with using the new VFX dimension items and Dimension Keys. If you have any questions, please feel free to leave a comment below and I’ll get back to you as soon as possible. The best stats depends on the Gear Slot (Helm, Shoulders, Cape or Neck) as well as what Tier and rarity your gear is (i.e. Tier 1 Relic Helm has different stat combinations to the Tier 2 Epic Helm). You can refer to the Dream Orb Stat Sheet to look up which stats are best for your Rogue. If you are DPS, you want the highest Main Stat + AP/SP for your character. If you are Tank you want the best Endurance-only. You got the numbers wrong for the orbs you are getting from dream weaving. Sadly you only get 4 greater orbs for 192 dream ribbons and 1 coruscating shard. Thanks for the correction Genji! Yea, for some reason I accidentally switched the Greater and Lesser Orbs for that particular table. Thanks Faradai. Yep, I did end up mixing up the two for the cost table, but I’ve since corrected it. I think you may need to refresh the spreadsheet to see the corrections. For leveling, each recipe costs Dream Ribbons + some other mat/s. The other mats are Fish, Lumber, Metal Bars, Plants and Leather that are gained from Fishing, Foraging, Mining, Foraging and Butchering respectively. So you will either need those other professions, or purchase the mats from somebody else off the Auction House (though chances are they’ll be overpriced with the initial rush for mats). For leveling itself – you’ll need to craft Dream Weaving-based recipes that are at least green to you (better chance of skill-up from recipes that are yellow or orange-colored) to level up. gotcha i was just working on buying the mats just didnt know if 1 profession would work or if i need the mats from all. Any stats known for the relic pvp Rank 90 gear? Not yet. Don’t think there’s many people with any Relic PvP gear yet – it costs quite a bit of Warlord Cells and a Radiant Infinity Cell. That said, as soon as I get my hands on a Radiant Infinity Cell and enough Warlord Cells – I can head over to PTS and fill out the stats for each. I went on PTS and did it for Rogue Relic Helm + Shoulders using greater orbs. i can give you the stats if you want. ill do necklace + shoulders when i get more radiant infinity cells. I was wondering, at what level do we start getting 3 ribbons out of the white artifacts? Should be when you become a Grandmaster (which you can do at Level 295 at your trainer). Thanks for the correction Veldan – it should be at 375 Dreamweaver. Note: Currently Greater Dream Orbs seem to work on Level 61+ gear, although this may be unintended since they seem to give the same stats. Savant Dream Orbs state that they give the best possible stat combination or endurance only, and will not give the main stat + endurance combo, whereas greater orbs will give the range of stats combinations – ie savant orbs are default BiS (unless you really want main+end), and greaters are the range – hence why they work on 61+. Unconfirmed but that’s what I suspect. Will we see an update for the 450 Savant details. I know common still salvages to 3 and uncommon goes up to 5, but what about the rest? Thx. Hey Vinprice! The only difference between Savant and Grandmaster is that (as you mentioned), Uncommon goes from 4 to 5 and Epic goes from 28 to 30. Rest are the same. yea, there definitely no leveling guide for 375-450 here. wish i had taken note of that beforehand.